Yesterday got off to a slow start, as I hung around the house for a while working on the computer. 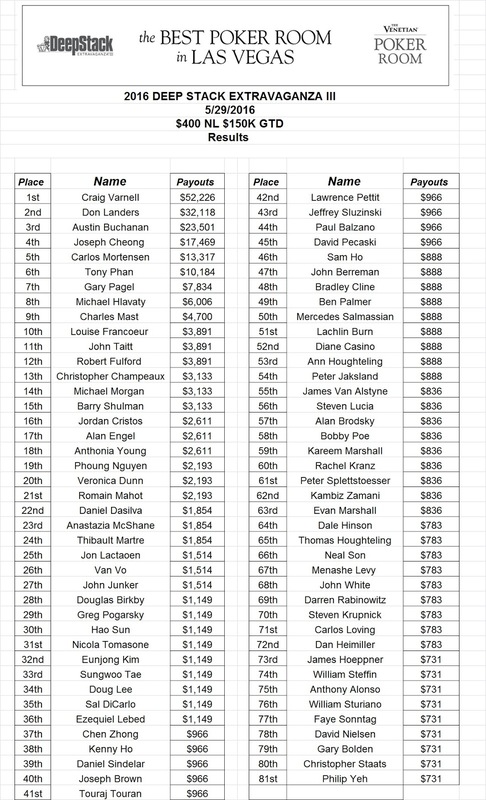 I followed up a response to the WSOP’s soon-to-be-official Twitter boss Kevin Mathers about the sizes of the Daily Deepstacks with a link to my article from last year with a chart of the prize pools through the whole season. You might find it useful. Cliff’s Notes: Mondays are usually the largest prize pools, probably as everyone takes one last shot before they head home from a long weekend. Played a little microstakes NLHE 6-Max on WSOP.com and lost the last $5 I had on there. K♣A♠ called after the two-diamond flop by 8♦6♦ and I lose 45BB. Onward! Headed over in the afternoon to the Orleans. 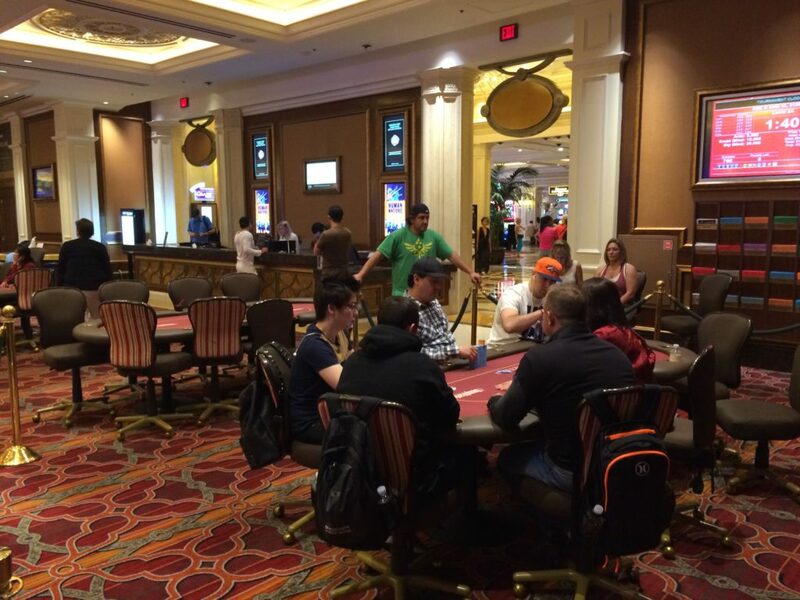 There was a long list for the 4/8 O8 game, but 4/8 Omaha had a seat open and I popped in there. Before I get my chips, I’m in BB with a couple of tens in my hand, but fold after the flop. There’s a crazy guy in seat 1, raising every hand. As it happens, I should have played with my tens, because by the river I would have made a set in a huge pot, and it would be the only hand in the session that I would have won. Crazy guy was literally shoveling chips into other players’ stacks and it felt as if vultures were swarming to get at the carcass because every time a seat or two opened, it would be instantly filled. 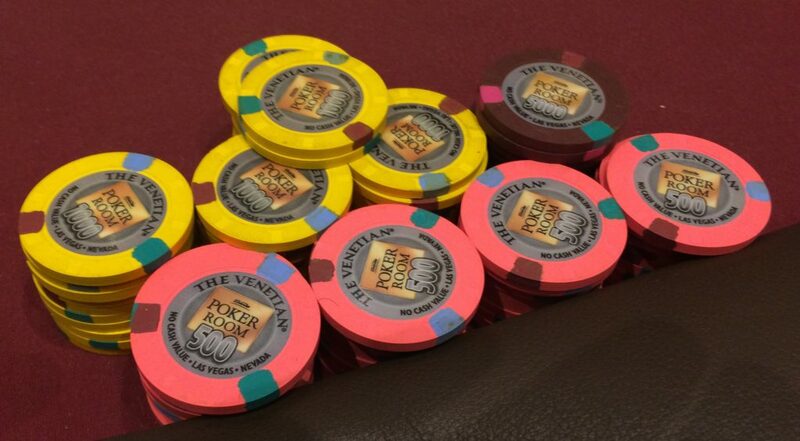 He was blowing through buyins so quickly that he’d put a hundred on the table after getting felted, and half the chips would be “in the pot” before the runner arrived with a rack. Frustrating not to be able to get a piece of that. After a hand where I made three pair on the Tx7x4x flop, I lost a good portion of my chips when an ace made a better two pair and it was downhill from there. I had a few hours to kill before either of the tournaments I wanted to play, so I went to the restaurant Tomer and I went to almost every night when I visited him during trips to the Series. 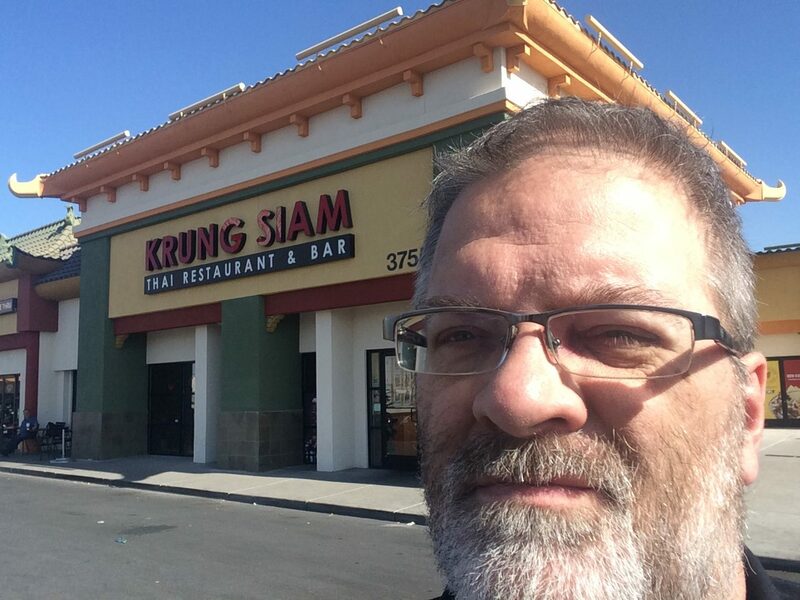 Krung Siam’s just a couple minutes drive up Valley View Road from the Rio—though it’s a long, hot walk in the Vegas summer. Then again, what isn’t? Got Drunken Noodles at a 7 on a scale of 10. Either I’m getting older or my memory of their heat scale is faulty. After the first bite, I was wondering if this was a good idea before I needed to sit for several hours in a tournament. And yes, I am trying to smile there (this was pre-dinner). That’s just the way it comes out. My choices for the evening were the 7pm HORSE tournament at the Orleans or the $15K guaranteed NLHE Survivor at the Venetian. I love playing HORSE, and the buyin was a third of the Survivor—which was an advantage on my poker blogger bankroll—but the median ROI advantage of the Survivor’s flat payout structure overcame my aversion to putting more than I’d just lost in the Omaha session in play, so I drove over and parked at the Venetian, registered for the tournament, then went looking for something like some ice cream to counteract the Drunken Noodles. Walked down to the Ben & Jerry’s at Casino Royale, but they didn’t have anywhere to sit; checked in at the new White Castle there but the line was incredible. There were any number of places in the Venetian itself to get gelato, but I wanted real ice cream, and finally found it after I went back up to the second level of the Venetian and found a Johnny Rockets, where I could get a chocolate shake. The game did not start off well for me. I quickly lost half my chips by somewhere in Level 2. Not doing anything bad, just having hands go wrong. There was a fair amount of aggression in the early stages, so the pots got large fast, and that meant some punishment when I had to fold. 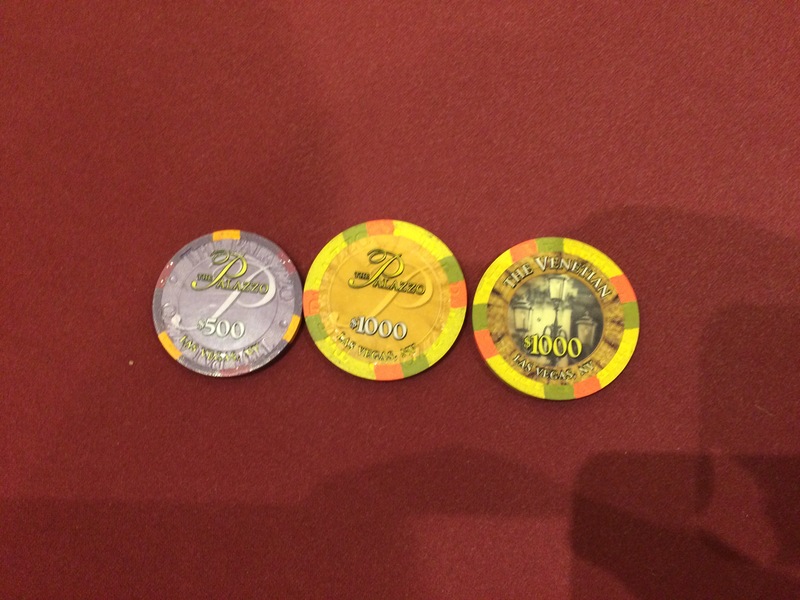 After a while, things turned around and I beat my way back up to starting stack and above. A couple of tables away, the final table of the first event in the Deepstack Extravaganza III was playing out. It was rather odd to think that both Carlos Mortensen and Joseph Cheong—each of whom has more than $11M in live tournament earnings—were playing in a $400 buyin tournament with a top prize of a little over $50K, but there they were, sitting next to each other without all the hubbub of the WSOP or WPT surrounding them. (Mortensen ended up 5th, Cheong took 4th.) Then again, I got knocked out of a $300 tournament by a billionaire a couple of years ago. Somewhere in the middle of the tournament, I picked up QxQx and shoved from the BB over a bunch of callers and a short-stack raise. One of the big stacks called, and the short stack went all in to show AxAx. The big stack had TxTx. The aces held up, and the player tripled her stack, but I had her covered by enough that I came out with a gain. From there, for a while, I had a run of very good hand and the position to take advantage of them. People folded when I raised with not-so-good hands, and they called when I had monsters. And the monsters held up. I took out several players as the tournament played down to three—and then two—tables. We’d started with 73, so the Survivor format (please, someone in Portland start a series of these!) paid out $2.5K for seven players as a straight chop, with an eighth getting $750. Starting stack is 12K, average stack at chop time is 120K (a little more than that in the nice, clean, new Venetian tournament chips in the photo—I forgot my card protector at the house), so if you could get up to 100K or more, unless you did stupid stuff like try to knock more players out, you were golden. Some people can’t help themselves. One young guy who’d looked me over and given me the “I’m letting you get away with it this time” speech before laying down his SB to my UTG raise with A♥6♥ blew away a stack comparable to mine, and ended up with eighth place. We survivors congratulated ourselves—I had a good time talking to my table neighbor Jason T who just swapped sides after the final table redraw and squeaked into the big money after falling victim to several of my three-bets—and picked up the payout chips from the desk. This almost proved to be my undoing. I stopped on the way to the payout cage to take a picture, then picked the chips up and got in line behind a guy with a couple racks of considerably more cash game chips. He asked if I’d been in the tournament (he may have thought I was in the $150K or the SuperStack that was still running), then asked about the payout, saying “Everyone get $2K”? I looked at the chips in my hand and there were indeed just the two $1K chips. I didn’t see how I could have dropped the $500 chip—I had a death grip on the yellows—so I walked back over the short path I’d taken and sure enough, there on the table where I’d taken the picture below was the $500. If you look close, you’ll see it’s a little smaller than the $1K chips; I’d stacked it on the bottom when I was picking them up, and didn’t notice it got left behind. Vanity may not kill you but it could cost you a pretty $500.